Christmas Day on BBC Radio 4 is always a wondrous mix of contradictions. And today is no different. …then crashing right into, at 4.30pm GMT (8.30am PT, 11.30am ET) Charles Dickens’ A Christmas Carol: Beyond Belief, looking at the Christian message behind Dickens’ classic with actor Simon Callow, author Claire Tomalin and John Bowen – Professor of Nineteenth-Century Literature at the University of York as well as the Rev Cheryl Kincaid, an American Presbyterian minister author of “Hearing the Gospel through A Christmas Carol”. No one else would do this. Then at 6.30pm GMT (10.30am PT, 1.30pm ET) there’s the fiftieth anniversary special of Just A Minute, the only entertainment show that has run for such a time with the same presenter, Nicolas Parsons. And in this show guests from across the programme’s history are brought together from across the half century for one night. And then… at 11.30pm GMT (3.30pm PT, 6.30pm ET) it’s time for the big one. The first part in an adaptation of Neil Gaiman‘s novel Anansi Boys in a new drama starring Jacob Anderson, Earl Cameron, Tanya Moodie, Adjoa Andoh, Joseph Marcell, Lenny Henry, Nathan Stewart-Jarrett, Sheila Atim, Pippa Bennett-Warner, Julian Rhind-Tutt, Cecilia Noble, Angela Wynter, Ariyon Bakare, Julie Hesmondhalgh, Danielle Vitalis, Ronke Adekoluejo, Clifford Samuel, and Tayla Kovacevic-Ebong, produced and directed by the amazing Dirk Maggs. 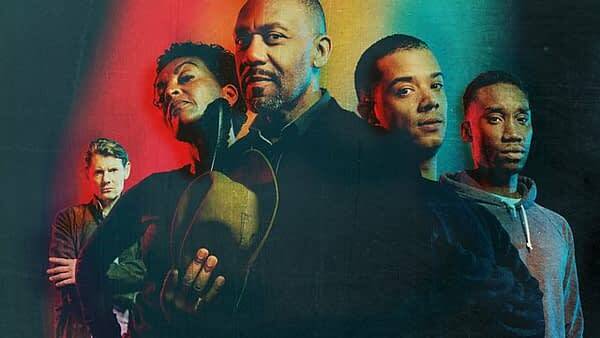 Neil Gaiman’s Anansi Boys comes to Radio 4, with a stellar cast, and a specially commissioned song written and performed by Jacob Anderson (Game of Thrones’s Grey Worm) who makes his radio debut as Fat Charlie Nancy, a South London boy whose dad is trouble. And not just your standard, run of the mill kind of trouble: more like, your trickster God and master of mischief and storytelling kind of trouble. Anansi Boys is a story of love, laughter, music and murder, old gods and new tricks, that takes Fat Charlie from his home in London to Florida, the Caribbean, and the very Beginning of the World itself. Or the End of the World. Depending on which direction you’re coming from. Jacob Anderson is a musician (as Raleigh Ritchie) as well as an actor. Starring as Fat Charlie, a young man who struggles to find his voice, he has also written and performed a specially commissioned song – Charlie’s Song – which forms part of the magical fabric of Anansi Boys. Can you think of a better way to top off Christmas Day?